"Sur le pont d'Avignon, l'on y danse, l'on y danse." On the Pont d'Avignon, you'll sleep really well, especially at the ibis. The reception staff will welcome you with their biggest smile, and the restaurant team will look after your every need. Located at the southern entrance to the city, you have easy access to the highlights of the capital of Vaucluse: the Palais des Papes, Pont d'Avignon, M.I.N., the exhibition center, the convention center and the best tourist attractions in the region. A good place to stop. Very helpful staff. Reception courteous and welcoming. Breakfast equally good as other Ibis hotels Room exceptionally small, toilet was dirty on arrival, no plug in bath, had to request further pillows (these have normally been provided in room), nowhere to rest suitcase. Good, comfortable. Pre booked a two course meal in your restaurant. Sadly, that only included the meal of the day, not your a la carte, which is only basic anyway. You should make the restriction more apparent. Your staff, as usual, were excellent. Efficient early check in. Welcoming, helpful staff. Bedroom, clean and tidy with enough room for three. Air con working well, decent room temperature. Comfortable beds. Good spread at breakfast. Excellent value. The room was unavailable until after 5 PM on our arrival day. Policy notice said, that any faults/complaints would be dealt with within 15 minutes. ( or refund would be made. We complained to the reception that the laminate floor was very dusty / dirty, an empty plastic drinks bottle was found under the bed. Our above complaints were made twice and took several hours to rectify. The soap dispensers were empty . In our opinion the maid did not know her duties. Very good welcoming, and competent personal. Rich breakfast choice. Appreciated swimming pool. Ventilation was a bit noisy in room. Breakfast dishes could be a bit cleaner. A most welcome,air-conditioned stay in a heatwave. As a family we numbered nine using five bedrooms having travelled by TGV from Paris. All were well satisfied with the bedrooms and the facilities offered. Well done Ibis - we will be using your hotels again. Great welcome on arrival from hotel staff. Immaculate and modern reception area. Rooms sadly were tired, mouldy and damp. Swimming pool good. Evening meal ok. Breakfast was brilliant. Checkout was efficient and easy. The only thing letting down the hotel was the poor bedrooms. 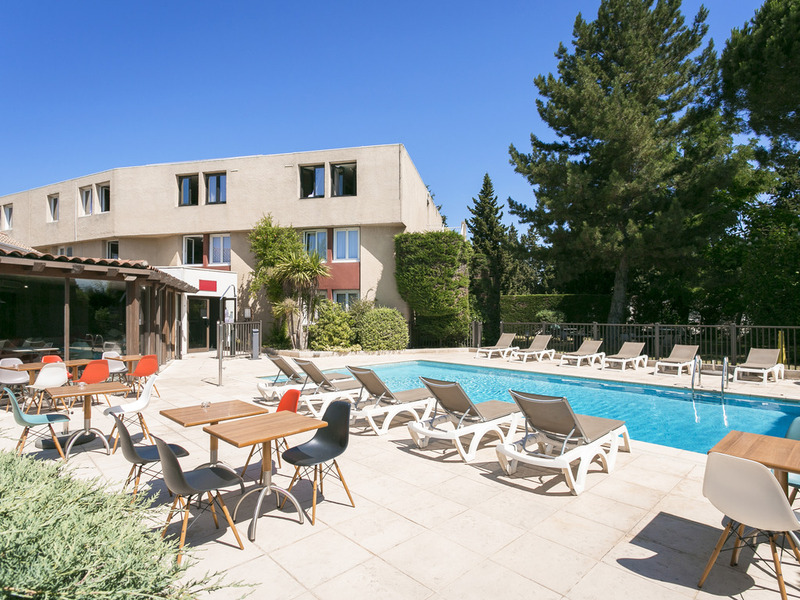 We stayed, 3 people for 2 days at Ibis Avignon Sud. The room was tiny, no place to store or open suitcases, the only place was on the floor in front of bathroom. Claustrophobic almost. No lift. We had dinner one evening, stay away from aioli, should think that aioli in France should be excellent, but was coarse and tasted awful and so did the bearnaise. Positive: Friendly staff at front desk. Good and quiet A/C. Breakfast ok, you have to boil your own egg, but no eggcup! (Should not cost to much to offer) Coffee good. Parking outside free and spacious. Hotel is neighbor to motorway, but quiet inside. Ibis is ok, but all very basic. We had a couple of problems during our stay, not with the hotel, and all the staff at this hotel were most helpful in assisting us in trying to resolve them. Clean rooms, very friendly staff, nice atmosphere. Good all round experience. Hotel used as a stopping off point when travelling between the UK and Monaco. Good clean rooms, secure car parking and a great pool - perfect when you've been driving for almost 12 hours. The hotel was renovated nicely. Ok rooms not fancy but nice. The pool area was a bit too small. Staff weee lovely, hotel is run down and basic.